The European and Yorkshire Champion has linked up with Centre Stage Percussion in a new five-year partnership agreement. Newly crowned Yorkshire Regional Champion, Black Dyke, has entered into a five-year agreement with Centre Stage Percussion for the exclusive supply of equipment to the current European Championship title holders. The announcement builds on the existing successful endorsement link between the parties, with Black Dyke Secretary David Hirst commenting to 4BR: "We are delighted to develop our partnership with such a progressive company, who, like Black Dyke, strive at all times for excellence in performance. Our world class percussion team are looking forward to performing on the full range of exceptional Centre Stage instruments." 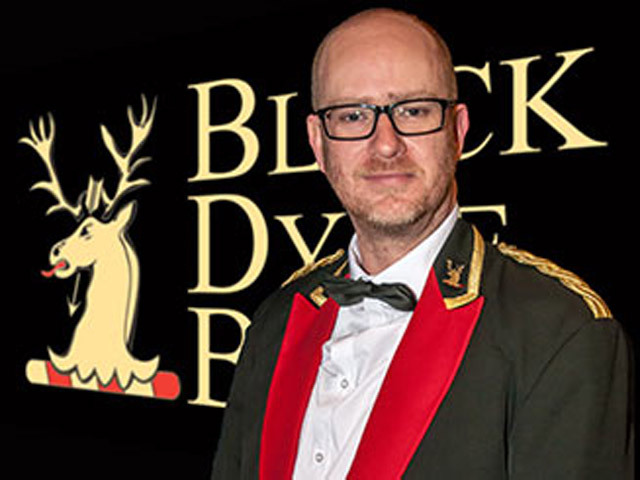 Centre Stage Managing Director, Martin Gernon added: "Black Dyke is synonymous with world class musical excellence - something which is also at the heart of what we do at Centre Stage Percussion. This agreement builds further on our highly successful partnership for the provision of our superb sticks and mallets range - and it is a real honour to be able to supply the most famous brass band in the world with their percussion requirements. We also look forward to developing new instruments with input from the band's talented percussion team." ​Centre Stage Percussion will be trading at the upcoming Regional Brass Band Contest's in Yorkshire (5th & 6th March) and at the Scottish Contest in Perth (12th & 13th March). 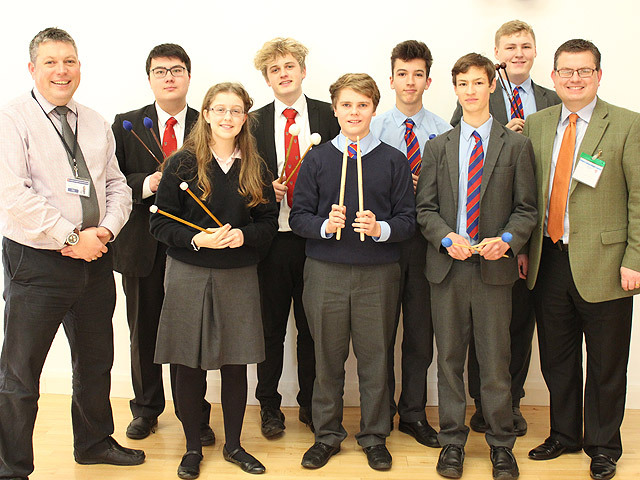 Centre Stage attented the annual Percussion Day at the Royal Northen College of Music recently. A busy day of trading and attending workshops, as well as meeting leading performers in the world of percussion. The particular highlight was a visit from one of the worlds finest vibraphone/marimba soloists Ney Rosauro. Ney is a Yamaha artist and was attending the RNCM Percussion day as guest soloist as well as giving various masterclasses. Ney spent some time with us at our trade stand, trying out our vibraphone and marimba with very positive feedback! Centre Stage Percussion has added a fantastic new 8 piece tom tom set to its market leading range. With black shells and chrome stands, these tom toms look and sound stunning. The drum sizes are 8", 10", 12", 14", 16", 18", 20" and 22". 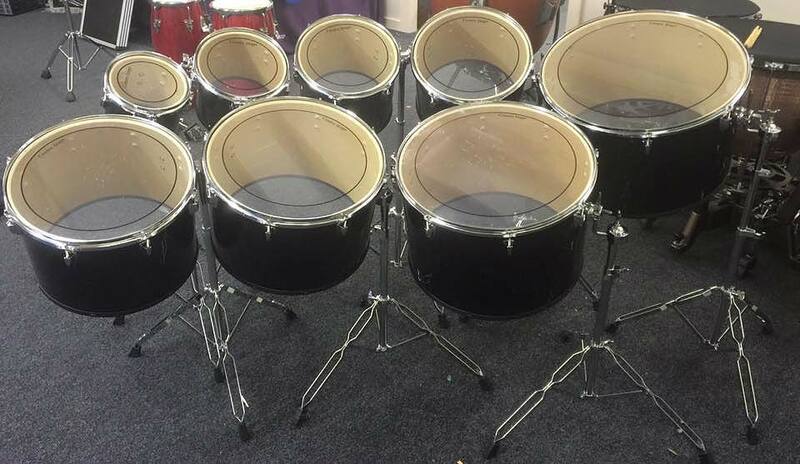 These toms will give great options for percussionists and conductors, particularly for the upcoming regional test piece Cambridge Variations. All that and they only cost £600 for the full 8 piece set! Two leading business make retail link as Band Supplies becomes exclusive retail distributor for Centre Stage Percussion in UK. Centre Stage Percussion has announced an exclusive retail distribution partnership with Band Supplies Ltd. The agreement ensures that Band Supplies will be the only retailer able to distribute Centre Stage branded percussion equipment in the UK. Band Supplies owner, Ronnie Tennant says: "Centre Stage Percussion equipment is excellent. It's now used and endorsed by some of the top bands and orchestras in the world, but also sensibly priced to be available to all levels of performers. As well as the great quality of the range, the sticks and mallets are simply stunning and we will be heavily promoting this over the coming months." He added: "Martin and his team show so much passion and commitment to their products, and new developments are added to their range on a regular basis. We shall be launching our partnership at the Butlins Mineworkers Championship and Centre Stage staff will be on hand to fully help customers with all their percussion needs." Martin Gernon, Centre Stage Group MD is also excited by the new link: "Band Supplies has an incredible customer base and an outstanding reputation for customer service, delivery and integrity - and we are delighted to be associated with this great company. Band Supplies will be the only retailer in the UK where Centre Stage percussion products will be stocked and distributed through. This is our commitment and support to Band Supplies, and we look forward to a great future working relationship." Centre Stage Percussion will provide the acclaimed LES Music School of Loughborough Endowed Schools with their musical needs. Centre Stage Percussion has announced that they have entered into a formal partnership with Loughborough Endowed Schools for the ongoing supply of its equipment to its acclaimed LES Music School. With six percussion ensembles, bands, orchestras and nearly 100 percussion students, the LES Music School is regarded as one of the most progressive of its kind in the country. The Wind, Brass & Percussion faculty is headed by Aidan Geary, himself a noted percussionist who played with the likes of YBS and Brighouse & Rastrick, and provides students with a modern, engaging environment as well as one which has already forged innovative links with local conservatoires, universities and bands. Aidan says: "The LES Music School has grown tremendously over the last decade and we now have three percussion teachers using bespoke teaching and rehearsal rooms. It's our policy to teach all aspects of percussion from day 1 with pupils encouraged to join ensembles from the outset. This allows continuity of teaching and produces excellent standards and results. This partnership adds to LES Music School's prestigious 'All Steinway' school status which was awarded earlier this year." He added: "What impressed us about Centre Stage was not only the standard and quality of their full range of products, but also the unbridled enthusiasm that Martin and his team put into the company. Nothing is too much trouble, and their passion for what they do is remarkable. The company is one of the most progressive we have come across, and we are certain they will develop to be a major market force." CSP Managing Director, Martin Gernon, is delighted that Centre Stage Percussion has been able to link with such a renowned music school. "We are delighted to be part of this outstanding partnership arrangement - on which we hope will continue for many years to come and provide a lasting legacy for LES Music School." Centre Stage Percussion has announced the appointment of the highly respected percussionist Neil Edwards as their new Product Manager. CSP MD Martin Gernon says: "As well as being a superb performer with Black Dyke, Neil's background, professionalism, technical knowledge and insight makes him the ideal person to further expand our increasingly popular percussion business arm. As well as serving an ever increasing customer base and with fantastic endorsees including Cory, Black Dyke and the International Staff Band of the Salvation Army, we are now also making significant inroads into the professional musical world - an area that Neil also knows well." Centre Stage Percussion has recently linked up with the BBC Philharmonic, Royal Northern Symphonia, Royal Ballet Symphonia and Ulster Orchestra and was recently successful in winning a Ministry of Defence Tender to supply percussion instruments for the next four years. Neil says: "Centre Stage Percussion is a very refreshing and innovative company. The product range and quality is excellent and the company's commitment to customer service and going the extra mile is already established in the marketplace. The brand is now well established and I look forward to helping develop this further in UK and export markets." Centre Stage Percussion branch out into the percussion hire market. Following many enquiries Centre Stage Percussion are pleased to announce the launch of a brand new percussion hire service. Centre Stage’s large and centrally-located facilities allow for the storage and transportation of a wide range of percussion equipment to match all needs, at highly competitive rates. With expertise in both performance and manufacturing, the personalised, tailored service offered by Centre Stage will enhance the smooth running of your concert, contest or event for a truly professional yet effortless experience. Centre Stage percussion instruments have been designed by experts, and with a particular focus on matching high quality with portability, they are ideal for hire. Hand-held instruments can also be provided, with sticks and mallets available on request; presenting an all-in-one service for ensembles travelling to the UK from abroad. Centre Stage experts will remain on-hand throughout your event for technical and logistical support. Centre Stage are looking forward to providing percussion equipment for all sections of the Wychavon Festival of Brass on Saturday 31 October, and you can also visit the Centre Stage Uniform trade stand. If you want the classic retro look but a fantastic modern feel for your drummer then Centre Stage Percussion has the perfect bit of kit for you and your band. Centre Stage Percussion has announced the launch of its new Silver 5pc 'Retro Classic' limited edition drum kit. The five-piece kit is made from superb 6-ply birch shells, finely honed to a 45 degree ultra smooth bearing edge, to give a superb sound from the fabulous double-ply oil skin heads. The exclusive silver wire wrap gives the whole kit a fantastic timeless 1970s nostalgia look, with extra thick hoops, expanded lugs and housings giving it a very secure feel and sound. The 'Retro Classic' comes complete with sound enhancing damper hoops for each drum, giving each of the tom-toms a deep, full sound reminiscent of classic kits of the past, whilst the snare comes complete with a trademark 42 string snare wire, powder coated Remo head, internal damper and smooth knock off. As an additional bonus Centre Stage Percussion is also including a hi-hat stand, cymbal stand, bass drum pedal and drum stool. "It's fantastic value for player of any level, affordable for all bands and ensembles and for its price, one of the best kits on the market today. Each kit is individually numbered and there will only ever be 100 produced. As we expect demand to be very high for these, please call to reserve yours now!" Kit Sizes: Bass Drum: 22 x 16" Floor Tom: 16 x 16" Rack Toms: 12 x 10" and 13 x 11" Snare Drum: 14 x 5.5"
Centre Stage Percussion will be exhibiting at the forthcoming Royal College of Music Percussion Festival taking place at the RCM this coming Sunday, 6th July. From Timpani and Marimba to Drum kits and Snare Drums the full range of Centre Stage products will be on display and available to purchase! There will be special offers available on the day, so don’t miss out, come along and support a great event! The fourth instalment of the RCM Festival of Percussion promises the usual stellar line-up, and a rich blend of entertaining and educational events. As well as enjoying performances and talks from some of today’s leading jazz, rock and orchestral drummers and percussionists, you can benefit from free drop in coaching sessions and attend the RCM Trade Fair – featuring some of the UK’s leading instrument manufacturers. The festival will culminate in a concert featuring the RCM Big Band and no fewer than four star drummers. Centre Stage was at the huge Fete Cantonale in Switzerland, a three day music festival, involving over 150 bands from Le Valais area of Switzerland. Held every four years, this is a musical Olympics for local bands, with all types of bands from marching, fanfare and military competing in several different classes for local bragging rights for the next four years. It was the first time the percussion ranges had been shown off to bands directly in Switzerland and the reaction was excellent, lots of orders placed and Martin almost ran out of business cards!!! Very popular amongst the bands were the new marching percussion ranges and the new copper and maple hooped snare drum, which sounds amazing!!! Clinics and workshops for young players were held throughout the weekend on different percussion instruments, and all had a great time!! Centre Stage Percussion was a major exhibitor at the inaugural Manchester Drum Show held at the George H Carnall sports centre, near to the Trafford centre. Almost 50 exhibitors showed their wares and particular attention was paid to our great range of kits and our new concert toms. So much so that there was never a point throughout the day when there was nobody playing on one of our kits! (Apart from the very welcome “give our ears a rest” breaks imposed by the management, thanks guys!). The event was a huge success and will become an annual event from now on. The highly respected BBC Philharmonic Principal Percussionist Paul Patrick certainly likes what he hears with Centre Stage Percussion. Centre Stage Percussion has announced that the latest high profile endorsee of their products is internationally acclaimed musician, Paul Patrick. As well as holding the Principal Percussion position at the BBC Philharmonic Orchestra for the last 25 years, Paul is a Senior Lecturer in Percussion at the RNCM, and Head of Percussion at Chethams School of Music. Paul has worked closely with many of the world’s greatest composers, including Sir Peter Maxwell Davies, Luciano Berio and James Macmillan, and has collaborated with them to create many new and exciting percussive sounds for the 21st century. He has also acted as the percussion consultant for many years for the BBC Young Musician of the Year competition. In addition, Paul also runs the percussion hire company, Patrick Percussion, which operates in Manchester and London alongside his son Oliver, who has followed his father in the world of percussion and has recently graduated from the Royal College of Music. Speaking about the range of Centre Stage Percussion, Paul told 4BR: "I have great pleasure in endorsing the Centre Stage range of timpani and percussion instruments. They have a sound of the highest quality across the full range, and careful attention to construction detail has delivered instruments built to withstand all the rigorous requirements of modern percussion playing. These are a most welcome addition to the choice of timpani and percussion instruments available to both amateur and professional players. Seeing is believing - and I would encourage all players to be trying out these instruments which are incredible value for money." Centre Stage Percussion Director Martin Gernon, added: "We are thrilled with Paul’s involvement with the company. To have a percussionist of such international respect as a strong endorsee of our instruments is simply wonderful. We look forward to working closely with Paul in the development of further instruments to supplement what is already a great range!" Centre Stage Percussion and Centre Stage Uniforms will be in the thick of the action in Perth this weekend. Both Centre Stage Percussion and Centre Stage Uniforms will be in the thick of the action at the European Brass Band Championships held at Perth Concert Hall this weekend. Not only will Centre Sage Uniforms be providing and presenting the winning bands with commemorative pennants, they will also have a trade stand packed with their extensive catalogue of bespoke uniforms and livery. Meanwhile, Centre Stage Percussion, having recently announced their partnership with English National Champion Black Dyke as their latest endorsee of their superb percussion sticks and mallets range, have some very special offers just for those making the trip to Perth for the exciting European event. There is a massive 20% discount on all sticks and mallet purchases made at the contest, and then a very generous 10% discount for all other orders placed at the contest for over £100! Offers, of course, cannot be used in conjunction with each other!! The Black Dyke percussion team will be using the full range of Centre Stage sticks and malletts. Centre Stage Percussion has announced that its latest endorsee for their superb range of sticks and mallets is the English National Champion, Black Dyke. The range, which will be used on all Black Dyke concert and contest performances, now extends to well over a hundred variations. Speaking about this agreement, Centre Stage Director Jon Davies told 4BR: "We are very proud that the outstanding Black Dyke percussion team feels that the sound, quality and versatility of our Centre Stage percussion sticks and mallets meets their demanding standards of performance, and we look forward to working with them to develop the range further." Black Dyke percussionist, Andrea Price, explained the reason for the endorsement: "We met with Martin and Jon at Centre Stage, and quite simply, the range of sticks and mallets was excellent. This was shown with the outstanding build and materials quality, which gave the perfect balance, detail and above all else, the sound quality. We are forwarding to using the sticks and mallets at the forthcoming European Championships in Perth and beyond. The other thing that impressed all the team was the very reasonable prices for sticks of this calibre, making them affordable for any band." "Black Dyke is synonymous with excellence, and has always enjoyed having world class percussionists in its ranks. That their team favours our range is a huge vote of confidence in what we are doing. However, this is just the beginning. We will be working closely with the team to develop and launch new sticks and mallets that will further enhance what is already a great Centre Stage range." There is a brilliant new drum kit and hardware package available from Centre Stage Percussion. Centre Stage Percussion has launched its incredible drum kit and hardware package. The signature six piece drum kit, made from superb 7 ply birch, for an incredibly deep and warm sound, has now been enhanced even further. In addition to the drums (22" bass, 10", 12",14" and 16" toms, snare complete with 42 wire snare), the package now includes two professional quality boom stands, two straight cymbal stands, professional hi-hat stand and snare drum stand. Also included is a double bass drum pedal in its own hard case for protection, and a full set of quilted carry bags. The complete set is just £1,000 including free delivery to anywhere in the UK. Centre Stage artist and professional drummer, Adrian Treacher, is a huge fan, as he told 4BR: "The standard of Centre Stage kits and hardware is equivalent, if not better, than professional standard kits from established brands that I have previously played on." He added: "The build quality of the shells, the double ply skins, suspension hoops and standard of the lugs and housings, give a clear, deep, true sound depth to the toms. The 42 wire snare gives the snare drum that additional crispness and clarity putting it in a league of its own. The hardware is rock solid and gives a great playing platform. You simply have to play these kits to appreciate their true quality." As well as producing incredible percussion instruments, Centre Stage is equally as concerned with ensuring the comfort and well being of drummers is looked after. This fantastic Drummers Chair (we don't like to call it a stool, as it is much more than that!) not only has a superb deep padded seat, contoured and shaped to be very comfortable, but also an adjustable back support giving vital lumbar support which maintains a healthy spine position, not only for playing, but also for counting 95 bars rest in comfort! With a good adjustable height variation, and double braced and locking tripod legs, is chair is as sturdy as it is comfortable. All this and it is priced at just £65.00! A brand new range of stunning marimba and vibraphone mallets have been unveiled by Centre Stage Percussion. 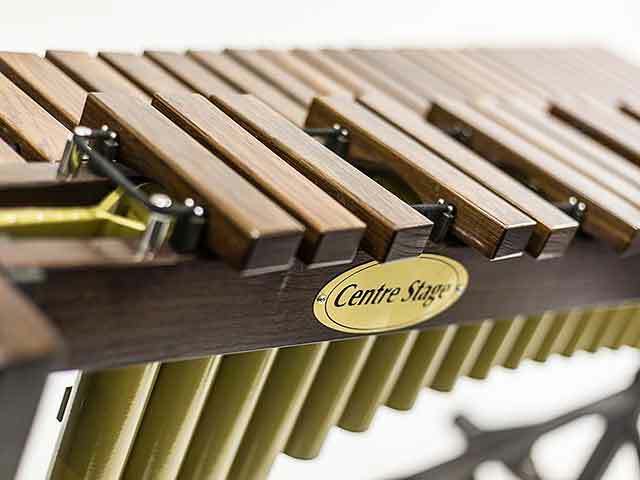 Centre Stage Percussion continues to meet the growing expectations of its customers with the unveiling of its latest stunning range of marimba and vibraphone mallets. With a selection of heads that range from very soft to very hard, and the choice of maple or oak handles, these mallets are perfectly balanced, superbly crafted and at just £15 per pair, fantastic value for money. A new era in percussion retailing has arrived with Centre Stage Percussion. Centre Stage Percussion has just launched its brand new website, as Managing Director Martin Gernon looks to create the same market leading impression on the banding world he has done with his highly successful uniform making business. The new venture has sourced some of the finest instrument manufactures in the world to enable Centre Stage Percussion to bring players and ensembles a new level of quality at affordable prices. "That has been our aim all along," Martin told 4BR. "The very best instruments money can buy. From the starter player to the professional, youth ensembles to full symphony orchestras—we have the ability to provide unbeatable instruments in terms of quality at fantastic prices." All aspects of the percussion genre are covered - from drum kits to tubular bells, all backed by Centre Stage seeking expert help in ensuring that quality is first and foremost in their product ethos. “We know we can compete on price—but we are unique I believe as that is also backed by Centre Stage Percussion being able to match the very best manufactures in terms of quality and innovation too. We have worked so hard to find the right manufactures. Our customers will be amazed by what their hard earned money can buy—it’s a new era in percussion retailing." Brass bands will also benefit too. Martin added: "We are very proud of our reputation and our connection to the brass band movement, so people who have known us over the years will also know they will be getting a premium percussion product backed by a premium level service." Centre Stage Percussion is here and re-defining the way in which you can meet your percussion needs - including free drum sticks! The Butlins Mineworkers Championship will see the launch of Centre Stage Percussion - an exciting re-defining way of purchasing the very best quality percussion instruments at amazing prices. With the full range of percussion instrumentation - from marching bands to full orchestral setups now available, Centre Stage Percussion offers players, bands and organisations a fantastic way of balancing superb quality with superb prices. Martin Gernon told 4BR: "Our aim is to redefine the way in which percussion instruments are sourced, marketed and purchased—for the benefit of the first time player to full symphony orchestras. That certainly includes the requirements and long term requirements of the players in brass bands, who are central to what we want to achieve." He added: "We believe there will be no better way for any player or band to meet their percussion needs in the future. This is world class quality at a world class price." Fellow director Jon Davies believes the extensive research and time devoted to sourcing the best instruments from around the world will be the key to Centre Stage Percussion success. "We have met with wonderful instrument makers - told them our requirements and come up with amazing deals that are aimed at giving players the very best musical experience at the very best price. The range on offer is superb: We have something for everyone." So why not get along at Butlins and see for yourself—and while you are there you can get your hands on a free pair of hickory drum sticks too! "It’s one pair per band - but we think we may have to get more in given the quality of what we have to offer!"